As mentioned in some of my other reports, in October / November my wife took our baby back to South Africa to visit her parents. This left me some time between shifts, as I work 4 days on, 4 off, then 4 nights and 4 off. Between day shift and night shift I then had 4 1/2 days. 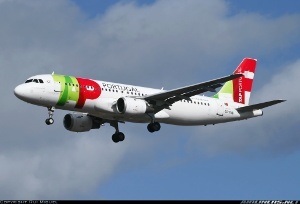 I've wanted to visit Portugal for a while, and TAP had a bargain flight back to Gatwick which I booked. 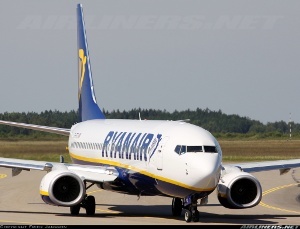 Ryanair also serve Porto, so I wanted to use them to be cheap, but the direct flight was too expensive, however if I flew FR to Dusseldorf Weeze, and then on to Porto the next day, I could get a ticket for £5 + €8, so that was booked. Some time later, I found an EI flight to Eindhoven from LGW for £9.99 taxes included, so booked it thinking if that was wise, and how I would get home. I've been looking at visiting Antwerp for a while, and found that VLM had a flight from there to LCY at a good price, so booked that for the afternoon of the day I was due to work the night shift. All planned! After speaking with a friend, he decided to come with me for the German sector, and return to STN with his 4 year old son the evening I continued to Porto. took a bus to the local station, and bought a ticket to Dusseldorf. We'd booked a hotel, at the bargain price of €20 per night per person, B&B, in a twin room (Chris and Toby) and a single (me). Hotel Haus Hillesheim. It was much cheaper to book though hostelworld.com than to book directly, bizarrely. They were not ensuite, though. The rooms were opposite sides of a small courtyard. The twin room had a shower in it, and the loo was immediately outside the room door to my single. The next day we bought a Shoenes-Tag-Ticket NRW, giving us all unlimited travel in the state of NRW for the day, for just €34 - €6 more than a single from the airport to the city. This ticket is valid for up to 5 people travelling together. We had decided to visit Wuppertal, to see the unique metro system, the Schwebebahn. 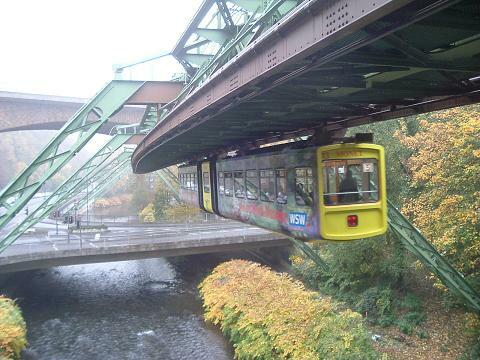 Schwebebahn - suspended monorail, the only one in Europe. We took a ride, and went to the zoo, where Toby was fascinated by the penguins. We left the zoo and headed back to the town centre, and after looking round some of the shops headed back to Dusseldorf where we changed train for a local to Weeze, where we caught the bus to the airport. We all went through security together, and Chris bought some chocolates for his wife. We then went to the cafe, I got an overpriced drink and sandwich, and Chris wanted the same, but they didn't accept cards, and neither of us had any more euros in cash. Their loss, he later bought food on board. Soon it was time for the STN flight to board, so Chris and Toby went through the passport control desk, and queued at the gate for their flight. Mine wasn't for another hour. Eventually my flight was ready to board, and like the previous one was a completely uneventful Rynanair flight. By now it was quite dark, and our route took us over Paris - I could see the lights of the city far below. It's interesting how English has become the world language - my two seatmates, a Portuguese guy working in Poland was speaking to his neighbor, a Dutch guy going to Porto on business, in English. We landed on time, and had to walk a mile through the airport to get to the exit, from where I caught the metro to the city and my hostel (Pedra Antiga), where I had a private ensuite single room for €21 per night. As I only had a day in Porto, I wanted to squeeze in as much as possible. 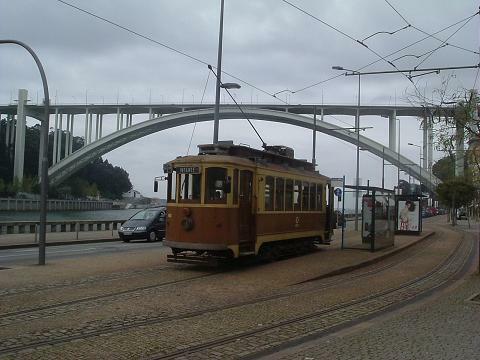 I saw the city centre, the tiling in Sao Bento station, and headed down to the Ribeiro area by the river. I walked along to the classic tram stop and headed out towards the tram museum, which unfortunaetly was about to close for lunch. So I went back, crossed the river and found a port wine warehouse, where they do tastings - very nice! After that I took the metro to the Estadio Dragao, where Porto FC play home matches, and bought a ticket for that evening's match against FC Belenenses, then went back to the tram museum. It's full of old classic trams, but no mention of the new metro, which in the suburbs runs at street level as if it were a tram. I then found an internet cafe to check in for my 2nd flight of the next day, LGW-EIN, as it would be a tight connection. Finally, I went out to the stadium for the game, which finished 1-1. 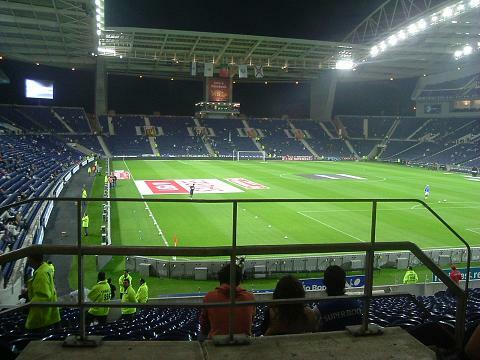 Estadio Dragao, before the game. A tiring day, and to bed. The next day I rose early and left on the metro for the airport, for my 09.55 flight. I checked in manually, and proceeded to security. 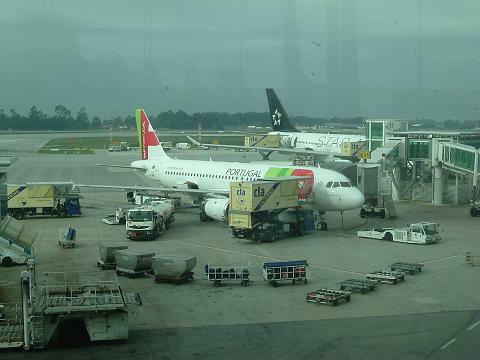 The Porto airport is very modern, light and airy. The non-Schengen area had its passport control to one side, and next to the normal desks was a couple of automatic passport cabins - you insert your passport or ID card, step in, and it takes a picture of you and compares it to the one on your passport. However, the one I tried didn't work, and also wouldn't let me back out again. Eventually I exited the way I went in and used a normal passport desk. By this time the departure of the flight was approaching, but there was no sign of the incoming aircraft. I only had 1h20 between flights. 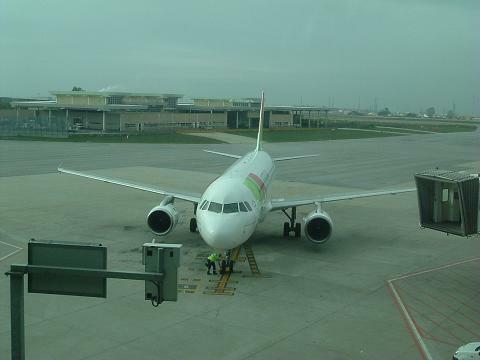 Eventually our A320 arrived next to the A330 bound for Sao Paulo, and we boarded. My A320 pulling up at the gate. My aircraft, and the A330 in Star Alliance livery, bound for Sao Paulo. The reason for the delay was the standard "delay to incoming flight". We eventually took off 50 minutes late. There was an onboard service, of drinks and a sandwich and fruit salad. Not great, not huge, but filled a little hole. As for load factor, the flight looked almost full. We eventually landed, and I ran out to find my connection. I literally ran all the way to the Flight Connections desk, where I explained to the guys on security there my connection. They looked at my printed boarding pass and said no, we don't have a scanner here, you'll have to go through immigration and back in through security upstairs. 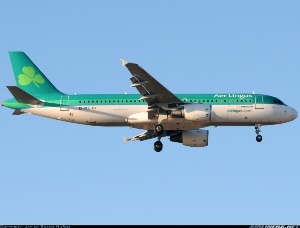 However, if I had an itinery, I could come through, and go to the Menzies desk - the handling agent for Aer Lingus. I went through the scanner, whilst one of the security guys went to the desk and phoned upstairs to the main desk. Apparently he was told that I had to go back anyway. Grr. I picked up my things and ran. Through passport control which seemed to take an age, through the baggage carousels and out, and upstairs to departures. I went straight to the security checkpoint (where they scanned my boarding pass) and through to the gate. The flight was due to depart in 5 minutes, but all the passengers were still there! Phew. The lady on the desk said that I must be Mr... and that I agreed. We waited in the holding area for what seemed like ages, before boarding started. We were told that on the incoming flight, there was someone who needed a wheelchair, but one hadn't been provided, so we had to wait for that to come and get the passenger. Eventually they must have been picked up as we started boarding. Again, it was an almost full flight. We took off and headed for the Netherlands. 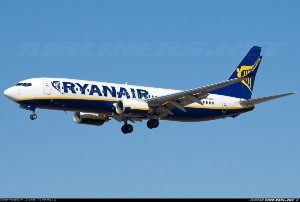 Aer Lingus are copying their national rivals Ryanair in having a BOB service on board, but I didn't buy anything. Actually, I think that I've only ever bought anything from any BOB service twice, and once was a work trip that was expenseable. 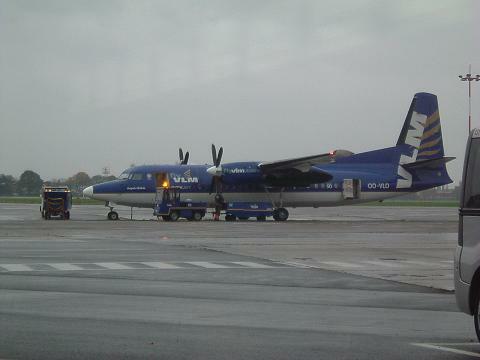 The short flight was quickly over, and we landed at Eindhoven airport. An interesting thing about EIN is that on exiting the runway, the parrallel taxiway is the opposite side of the runway to the terminal building, so we taxied the length of the runway before crossing it again. This isn't really a problem at the moment as there's not much traffic there, but could be if traffic levels increase. I took the airport bus to Eindhoven station. The city looks very modern, with high-rises and office blocks. I bought a ticket to Antwerp, that involved 2 changes of train. Strange that 2 major cities relatively near each other have no direct trains. 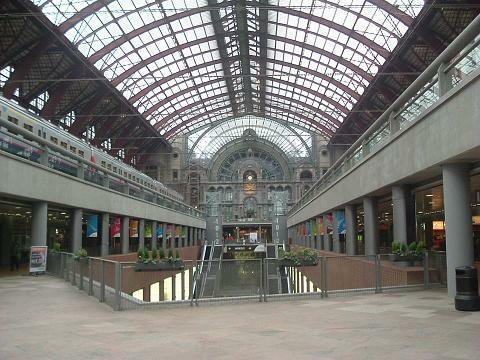 I arrived into Antwerp central station, and found my hotel, the Etap. I was too tired to go out and eat, so I just drank some water and went to bed. The next moring I had intended to buy some breakfast from the Lidl next door, but it was closed as it was a Sunday. Never mind though as there were plenty of options in the main station. The station is an impressive building, designed by Eiffel, it now has several levels of train platforms - uppermost are terminating platforms, and below are through platforms. I headed into the city. I first tried to find a metro kiosk, to ask about the airport bus. There was someone on the platform, and I've never met a more helpful member of staff. They showed me how to use the machine to buy a ticket, and took me outside the station to where the bus stop was, and pointed out what times they left. I thanked her and went looking for the diamond museum, which turned out to be closed. I then went into the city centre, to the main square, which like Brussels has some impressive old buildings. I found the castle by the river, which is now the maritime museum, but this too was closed. I headed back to the station for the bus to the airport. 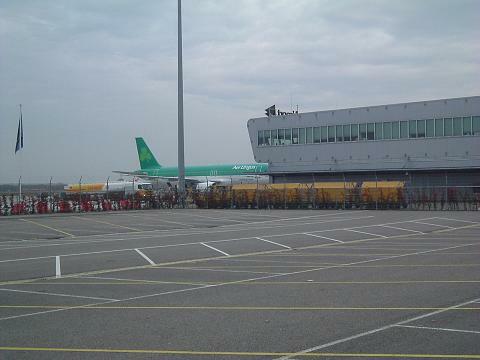 Antwerp airport is very small, smaller even than Norwich. There is an art deco sign on the outside of the building, but has been altered since build. 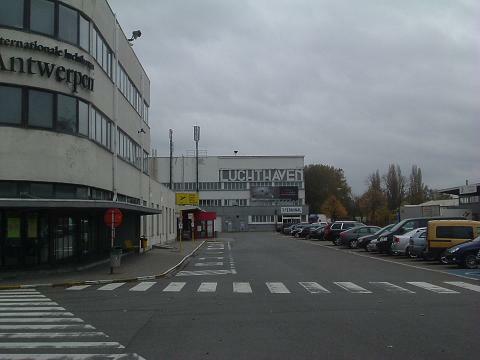 Originally it said "Aeroport Luchthavn" but the French has been removed. The checkin desks only opened 1 hour before departure, and there are only 3 flights per day, so there were not many people around! I'd arrived 2h before, so went outside for a look. There is a small aviation museum next door, well worth half an hour of anyone's time, and it had great views over the apron. Again, pity about the lack of traffic to watch! I headed back to the terminal and checked in, and went immediately to security. Just after security non-schengen passengers (in fact all 3 daily flights are to the UK) go to passport control, then into the "Departure Lounge", one triangle shaped room with a door leading to the apron, a toilet and a vending machine. I sat down and waited for the aircraft to be ready. The Schengen area must be for the (rare) charter flights to the sun, Spain mainly I'd say. 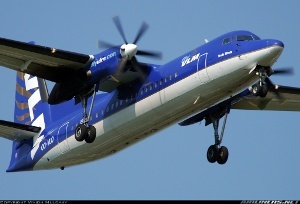 There were 2 Fokker 50s on the apron, one of which must have been ours. Our F50 from the terminal. That is how far the bus drove us. Eventually, the agent came and announced boarding. A bus pulled up by the door, and we boarded this bus. It had to reverse, then turn around before driving the 100m or so to the aircraft - it would have been quicker to walk! I boarded and took my window seat. Load on this flight must have been close to 60%. The captain started the engines, and we were off. The takeoff roll seemed rather slow, maybe I've been too used to jets! 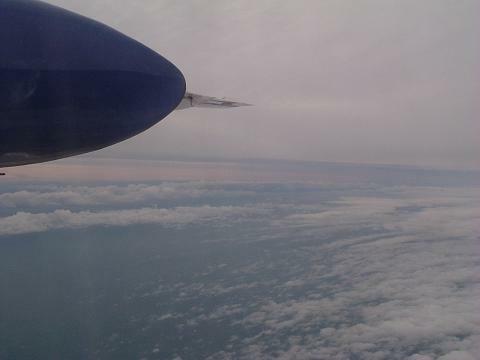 But we took off ok and bumped our way through the clouds. A service started - a sandwich and drinks. This was followed by hot drinks, then a bit later on by a chewy sweet. Very attentive crew, and well done by VLM. Whether this will continue after the merger into Cityjet is complete, I don't know. The descent into LCY was interesting, from the coast it seems like you're flying level, then at the last minute a dive down to the tarmac. We turned off the runway and pulled up by the terminal. The cousin of one of my friends is a ramper at LCY, but it didn't look like he was working that day. I went through immigration, and was on the DLR platform within 10 minutes of landing. I took the train to the city, where I'd booked a coach to go back to Stansted - Originally I'd thought we'd do the train to the airport with Chris and Toby. From there I took a train to Newmarket where I work, via Cambridge, and arrived with 1/2 to spare before I started a night shift at work. Overall, a quick trip around Europe on planes and trains, very enjoyable. But it was then back to work, and looking forward to the return of my wife and baby! Next trip coming up - South Africa for Christmas with the in-laws.